To win this game you need to understand place value and the game can easily be adapted to include decimals. All versions of the game can be played by a whole class as a lesson starter or in pairs. You will need a 0-9 spinner like the one in the picture or a 0-9 dice. Click here for instructions and template for making the spinner. Each player must draw a grid like the one shown. In the spin high game the players aim to make the largest possible 4-digit number. As a whole class game the teacher spins the spinner and calls out the number and the players must choose which of the 4 squares to place the number in. 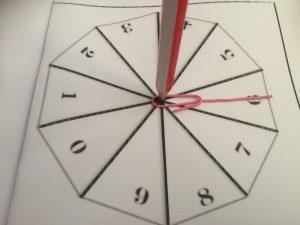 The teacher spins the spinner and calls out the number 3 more times and each time the players must write the number called in one of their boxes. Players with the highest number get 1 point. The game is repeated and the first player to get 5 points wins the match. In the spin low version of the game the players with the lowest 4-digit number win a point. Other targets can be set and players can take turns to choose the target. The grid for the decimal version is as shown. A target is set and three numbers are chosen randomly by spinning the spinner as in the other versions. The player or players closest to the target number win a point.